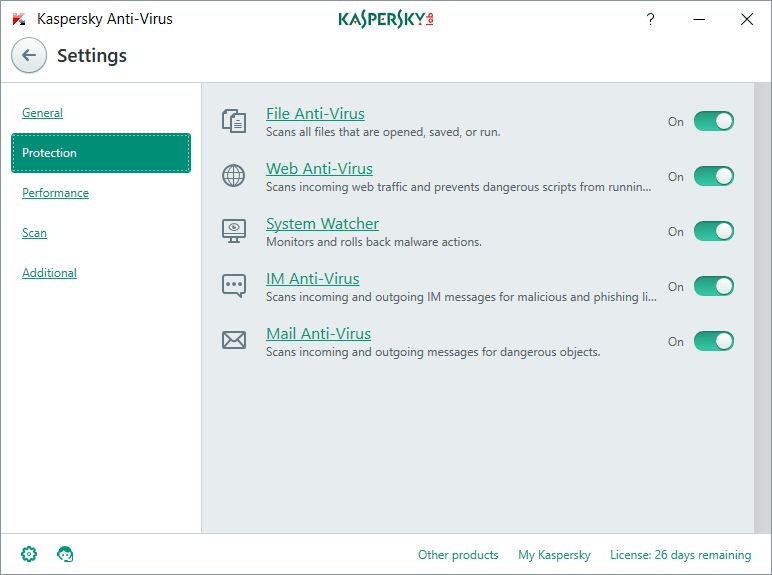 Like any good anti-virus software should, Kaspersky Anti-Virus does a great job at catching dangerous applications or threats before they can infect your PC. Whilst running a plethora of active protection tools alongside the standard file anti-virus, the software runs quietly in the background without becoming a resource hog. The new user interface is simple enough to get to grips within the first few seconds of using it. On the front page, you have access to four of the tools you'll be using most often: scan, report, database update, and on-screen keyboard. When you click on the scan page, you'll be able to choose between a full scan, a quick scan, a selective scan, and an external device scan. You can also schedule scans with the tools on this page. You'll be able to use this, as well as the options within the settings menu to essentially run all of your security tasks on autopilot. 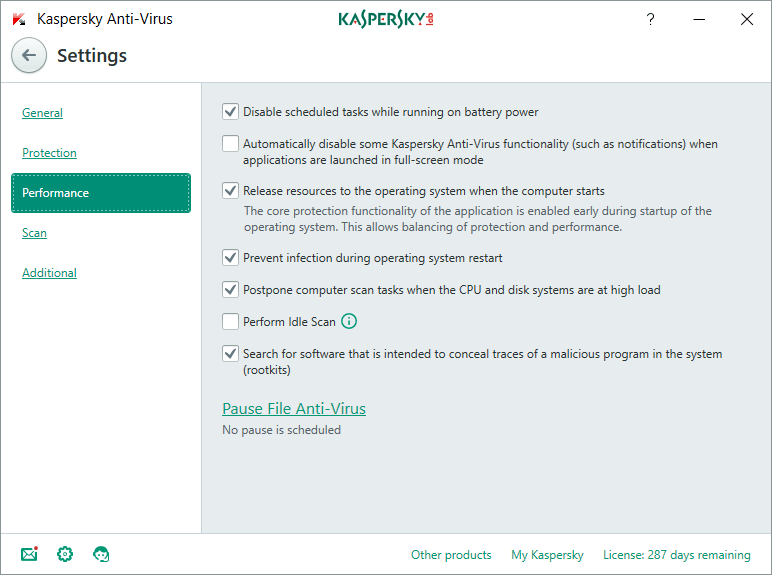 Although a full scan from an anti-virus software is going to take some time, we found that full scan did take longer than other options, such as Bitdefender. The on-screen keyboard is very useful for anybody that cares more about security or is worried about a potential keylogger on the system. The on-screen keyboard allows you to enter passwords and other sensitive information in a closed environment, leaving no potential for keyloggers to track your keystrokes. There are many other tools hidden within the interface as well. 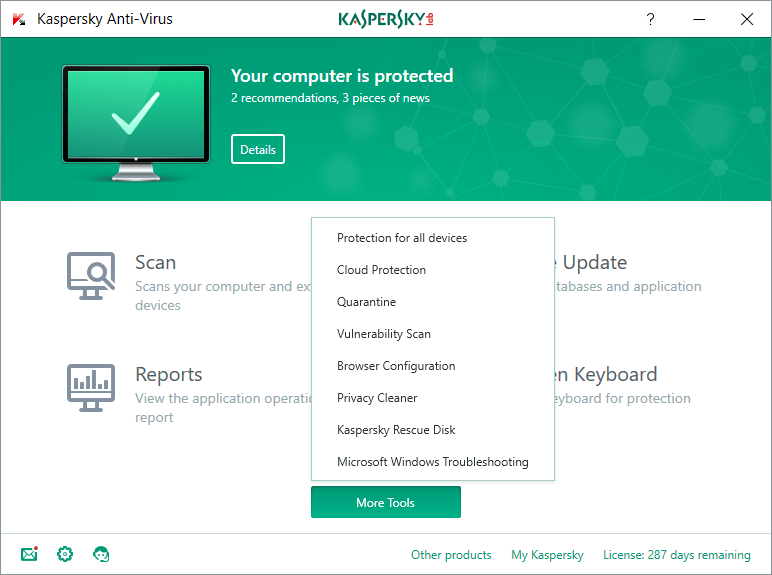 When you're on the homepage of Kaspersky Anti-Virus, you'll be able to click the 'More Tools' button to get access to these additional tools. With these additional tools, you can view any quarantined files, view cloud protection information, check your current software and OS for any vulnerabilities, clean up saved information to protect your privacy, and recover your data and operating system after an infection. We also have a lot of good things to say about the Settings menu. Practically everything can be controlled and customized from here - settings for automated protection and controls for improving system performance are some examples. 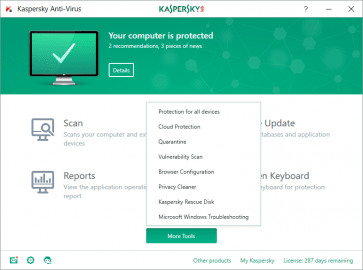 Kaspersky Anti-virus does come with an instant threat protection - this does an incredible job at instantly quarantining dangerous files. It's excellent at catching real threats, but sometimes it'll mistake less known programs that may be safe, as a threat. 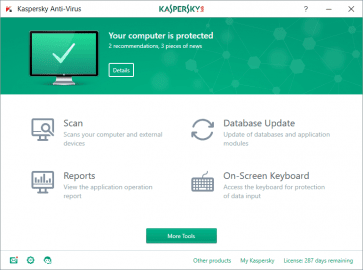 In summary, Kaspersky Anti-virus is an optimized anti-virus program that provides the protection tools you need, inside a clean user interface. There's very little to complain about, besides the few false alerts you may experience from the threat protection tool every now and again.